Wayne State University Press, 9780814338452, 368pp. The Honorable Damon J. Keith was appointed to the federal bench in 1967 and has served as a judge on the United States Court of Appeals for the Sixth Circuit since 1977, where he has been an eloquent defender of civil and constitutional rights and a vigorous enforcer of civil rights law. 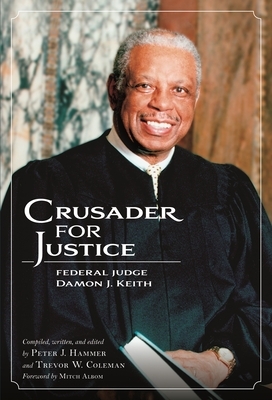 In Crusader for Justice: Federal Judge Damon J. Keith, authors Peter J. Hammer and Trevor W. Coleman present the first ever biography of native Detroiter Judge Keith, surveying his education, important influences, major cases, and professional and personal commitments. Along the way, the authors consult a host of Keith's notable friends and colleagues, including former White House deputy counsel John Dean, Supreme Court Justice Clarence Thomas, and industrialist Edsel Ford II for this candid and comprehensive volume. Damon J. Keith was born in Detroit, Michigan, on July 4, 1922. He is a graduate of West Virginia State College(B.A. 1943), Howard University Law School (J.D. 1949) and Wayne State University Law School (LL.M. 1956). In 1967, President Lyndon Johnson appointed Keith to the United States District Court for the Eastern District of Michigan, where he ultimately served as chief judge. He was appointed to the United States Court of Appeals for the Sixth Circuit in 1977. As a member of the federal judiciary, Judge Keith has been a courageous defender of constitutionalrights, giving real meaning to the promise of "equal justice under law." Judge Keith is the recipient of numerous awards, most notably, the NAACP's highest honor, the Spingarn Medal, and the Edward J. Devitt Distinguished Service to Justice Award, the highest honor that can be bestowed on a member of the federal judiciary.Trevor W. Coleman is a national award-winning journalist, who has been an editorial writer, and columnist for the Detroit Free Press. He was chief speechwriter for former Michigan governor Jennifer M. Granholm and director of communications for the Michigan Department of Civil Rights. He is a graduate of The Ohio State University and father of two college students, Sydnie and Trevor II.Mitch Albom is an internationally renowned and best-selling author, journalist, screenwriter, playwright, radio and television broadcaster and musician. His books have collectively sold more than 35 million copies worldwide; have been published in forty-eight territories and in forty-four languages around the world; and have been made into Emmy Award-winning and critically-acclaimed television movies.